Welcome to the CIJ Etsy Craft Party! Welcome to Team CIJ’s Online #CraftParty 2015. This day will be filled with lots of activities, DIYs, Giveaways and Coupons to grab along with the online Swag Bags and freebies! This year’s Etsy Craft Party theme is Kaleidoscope: Paper Taking Shape. Kaleidoscopes represent many individual pieces coming together to create something beautiful — much like the dynamic shops that make up Etsy. A party is no fun without the “Goody Bags”, don’t worry we have one for you even in this Virtual Party! This bag is filled with downloadable projects and tutorials for you to print and make! Grab the % Off Coupon and Go Shopping! Don’t forget to share the love!If you are crafting with us, be sure to tweet, Instagram, and/or Facebook us your projects. Also share the CIJ Craft party DIYs on social media! Last but not the least! It’s the Party Prizes! Toss your name into the hat below for your chance to win one of prizes offered up by our fabulous sponsors. Contest ends at midnight EST and the winner will be announced Monday on the blog! Now, LET THE PARTY BEGIN! Our party is Online so you can join in from anywhere in the world, how exciting is that!! Come and join Team CIJ for Etsy’s Annual Craft Party event, a global celebration of meeting and making. 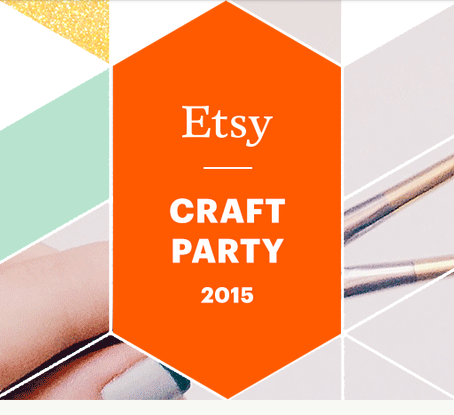 This year’s party is even more special as 2015 marks Etsy’s tenth anniversary. No. of Guests – Unlimited! 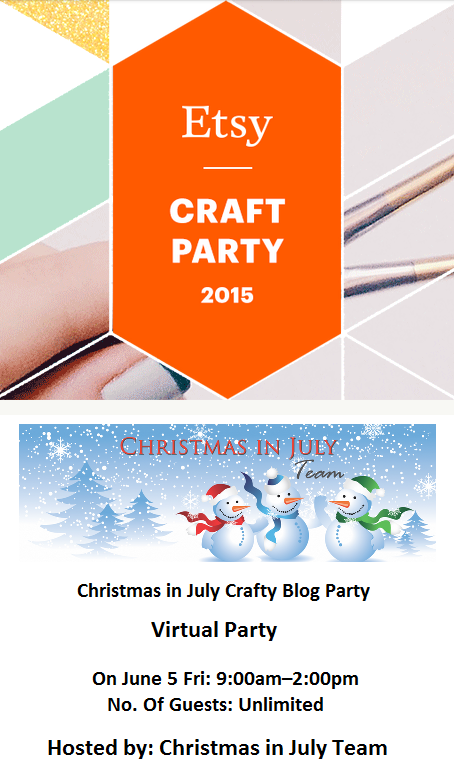 CIJ’s Online Craft Party 2015 is taking place on Friday June 5th, there would be lots of activities, DIYs, Giveaways, and Coupons to grab along with the online goodies and freebies! So come join the fun, invite your friends and family! CIJ Etsy Craft Party – In Just About 2 Weeks! Since our party is online it doesn’t matter where you are based just sign up here to join the fun! In 2014, more than 8,500 people took part in Etsy’s Annual Craft Party, including hundreds of party hosts. See all the fun from last year’s party over the world! 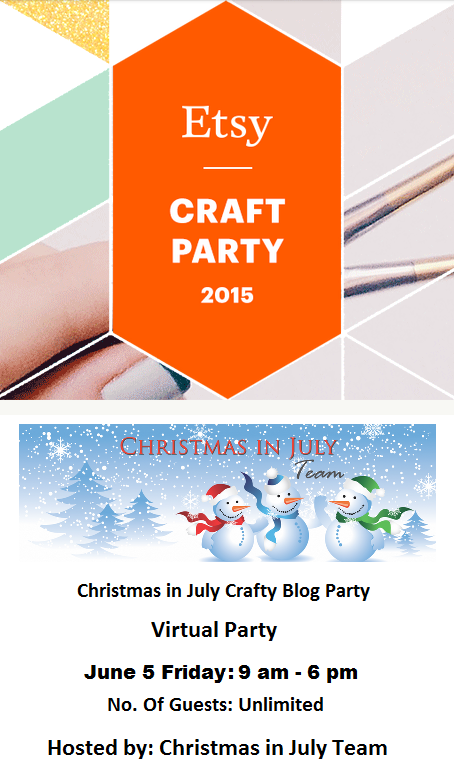 CIJ’s Online Craft Party 2015 is taking place on June 5th, there would be lots of activities, DIYs, Giveaways, and Coupons to grab along with the online goodies and freebies! So come join the fun, invite your friends/family! Here are some wonderful “Graduation Gift” ideas. I don’t have anything that is specifically for graduations, but I do have items that can be given for graduations, such as this pen which is based on my shop logo. The actual logo is an original collage piece, one of the first ones that I did and one of the few early ones I’ve kept lol. The collage is in my favorite colors, and shows a Victorian woman who thinks it’s time for a change. I’ve never listed the actual collage for sale in the shop – maybe I should. Anyway, I decided to have the pens made as a try-out in the shop and much to my surprise most of those I ordered have sold. I also gave a bunch as Christmas gifts to friends and family. I’ve no specific graduation present, unless you want to give a personalized portrait or a wreath. But I created graduation favors. In Italy, on this occasion, we generally use red color and little decors ( a ladybug or an owl ). We believe they are lucky charms. Get your graduates ready for Graduation with these wonderful vintage graduation party supplies! Set the table up with Hallmark’s “caps & scrolls” paper tablecloth and decorate the cake with either the boy or girl graduate or Both!! Celebrate this huge milestone with the ones you love! I received a request for a graduation card for a very special young lady that will be graduating from high school. I created a bold and contemporary card that would make a lovely keepsake with the year of graduation. For the graduate that knows what it takes to get the diploma.! Something small, soft, and memorable was my inspiration for making this cute little owl. A special ring, it can be the perfect gift for a graduation with a feather imprint and a beautiful emerald green color, that can inspire happy, light times ahead. This ring be worn as a statement piece with long skirts or dresses for a bohemian look at the beach or any other holiday destination. School is about more than just going to class. Commemorate your home, college town, or spring break memories with customized map art. I had an Aunt who lived in Philadelphia when I was young. Living in Baltimore, we didn’t get to see her much, so her visits were special, like when she came down to see us when I graduated. She gave me a charm bracelet as a graduation gift. I still have it. That inspired me to create this special “Graduation” charm bracelet. Beautiful rainbow colors merge into one another in this scented rainbow square chunk pillar candle. This candle is made in a 3 pour process, and has a core candle with the rainbow chunks set around it. This process creates a better quality, longer burning candle. Not sure of the total burning time, but I still have one that I light from time to time and its been with me for 11 yrs! Colors will vary slightly as each candle is hand made. Shown here unwrapped, it will come to you, wrapped in cello and tied with raffia/hemp cord. This gorgeous rainbow candle would make a wonderful unity candle for a wedding, a great gift for a friend or loved one, a thoughtful graduation gift or a beautiful sentiment for a memorial service. Chakra is the Sanskrit word for wheel. There are seven chakras in the body, located in a straight line with your spine; this line runs down the center of your body, from the top of your head to the base of your spine. Each chakra is an energy center and is represented with its unique color. Color meditation involves focusing on each of your chakras and their color vibration in order to bring about balance in your mind and body; promoting healing and peace of mind. (Each of the chakras relates to the elements of Earth, air fire water, ether, spiritual awakening and enlightenment. I love this quote, and I think it’s the perfect gift for a recent graduate as getting your way through those finally days can feel like a real push! These cute little scrapbooks make a perfect gift for the graduate. All of the hard work has been done. You only need to add photos and you’ll have a special keepsake to remember your accomplishment. They’re also a great way to display photos as graduation open houses/parties. My work of art is an acrylic on canvas. Since I have always enjoyed “drawing stories” it is what I still do. 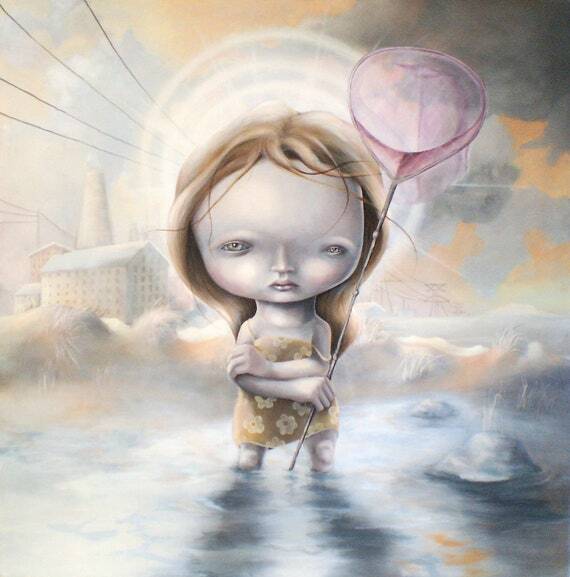 I have fun creating, I like the challenges to my mind, and also the technical challenges it makes me face. But it is also a medium for me to communicate to others my thoughts and feelings around subjects that I find important. One of the subjects that “drives” me and I feel there should be a lot more focus on is the state of the planet and the destructive side of man. Again and again, we make bad choices with horrendous consequences for this beautiful planet and this saddens me more than I can say. There is a lot of this in my work. Since the subject matter that I want to explore and communicate is so dark and melancholic I like to juxtapose this with a beautiful fairytale-like look to the image. I want to “draw” the onlooker in and then let them discover that everything is not as it should be in this “beautiful” place.